The journalists' rule of thumb in China is that you cannot report the so-called three Ts - Tiananmen, Taiwan or Tibet. But it turns out there is also another T that upsets Chinese censors. Jeff Sun is the scion of one of China's new rich and the founder of the "China Super Car Club". He has got so many he cannot even remember them all. With a bit of head scratching he can list the two Lamborghinis, the two Ferraris, the Audi R8 and the Maserati. But then there is a long pause before his face suddenly lights up. "Ah yes," he says, "and the Bentley". 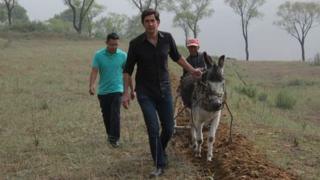 We filmed in some of the poorest communities I have ever visited - Chinese villages where no-one has ever owned a car and where they still till their fields using a single donkey, shared between dozens of farmers. China still claims to be a communist society and has a fearsome reputation for censorship, so why was it happy for us to do this? The answer says a lot about both China's ambitions and the challenges the country faces. A couple of years ago I made another series, this one about China's great expansion into the world over the last decade. I had not expected the Beijing government to like the films. We met some very sympathetic Chinese people but we showed the corruption and brutality of others. Yet, shortly after the programmes were broadcast, I received an email from a senior official at the Chinese embassy inviting me to tea at a London hotel. It said the Embassy had liked my programmes. In the genteel grandeur of the hotel the embassy official told me why. "We thought you were fair," she said. "You showed the Chinese people as they are." She took a sip of tea from the bone china cup and told me the rest of the world seemed to think that the Chinese did not have the same hopes, fears and ambitions as everyone else. "They believe China is a threat to other nations. We want people to understand they do not need to be afraid of us," she said. My guess is we were allowed to explore the eye-watering inequities in Chinese society because the government reckoned that on balance we would again, present a sympathetic picture of Chinese people. Furthermore - by showing just how rich many had become the government knew we would project a powerful message about China's success. At the same time the poverty of hundreds of millions of others, would illustrate the huge challenges the country still faces. Nevertheless we did not entirely escape the censors. The journalists' rule of thumb is that you cannot report the so-called three Ts - Tiananmen, Taiwan or Tibet. In an article in the country's English language newspaper, China Daily, I came across an editorial featuring stinging criticism of China from the WTO. Not the World Trade Organisation, this was the less well-known World Toilet Organisation. This WTO had ranked China as having the worst public toilets in all Asia. The paper explained how, in response, Beijing had introduced rigorous new hygiene standards - now no more than two flies are allowed in any public toilet. The paper was in no doubt about the importance of the issue. "Clean public toilets are the symbol of a civilised society," it thundered. The controversy made me chuckle and I mentioned to our government minder that I wanted to cover this storm in a toilet bowl. It was Mr Chen's job to ensure we did not break any reporting rules. He had been a cheerful, relaxed companion throughout our three-week journey, but now his face darkened. "I do not think that would be a good idea," he said gravely. I laughed, assuming he was just being a bit conservative. "No", he emphasised. "I really do not think that is a good idea." I said it would only take a couple of minutes. Just a bit of fun. "I am sorry Justin but I have to tell you cannot report this story at all." This was getting serious. Our Chinese fixer was visibly anxious and quietly warned me that if this went any further Mr Chen was likely to close down our production completely. I was learning an important lesson. China may be undergoing the most incredible economic transformation, but the Chinese Communist Party's instincts have not changed. It may let you speak to the idle rich and the abject poor but threaten to embarrass it - even with something as trivial as some criticism from the World Toilet Organisation - and the sinews of power become all too apparent. We were close to the end of our long journey and could not afford to jeopardise our project now. I decided I had to close the door on the Chinese toilets. China On Four Wheels is broadcast Sunday 9 September at 20:00 BST on BBC Two. You can read more about Justin Rowlatt's journey on the BBC TV Blog.